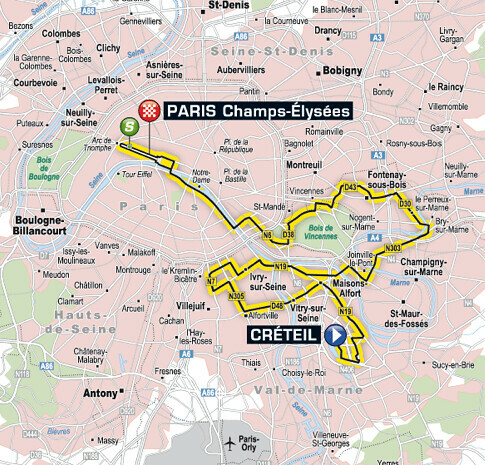 Bruce McAleer has this bike ride suggestion from Créteil to the Champs-Élysées based on Stage 21 of 2011 Tour de France route. Every year, the final stage of the Tour de France ends on the Champs-Élysées in Paris, but the towns it goes through en route are always different. In 2011, the Tour went through the Val-de-Marne département – one of metropolitan France's 95 administrative divisions, which lies south-east of the city. The part south of Paris stretching along the Seine has historically been industrial and working class, while the eastern part along the river Marne and Bois de Vincennes are more residential. These towns east of Paris can make delightful, off-the-beaten path destinations for cycle tourists in Paris. There are pedestrian and bike lanes along the Marne, making for very pleasant cycle rides out of Paris. The starting point of the last stage of the 2011 Tour was Créteil, which borders the river Marne and is the chef-lieu (capital) of the Val-de-Marne, therefore a major administrative centre. Créteil tends to remind French people of ambitious 1960s architecture (it is famous for its 'choux' - literally 'cabbages' - the nickname given to its strange circular mid-rise condo towers), France's first shopping mall 'Créteil Soleil', its courthouse, one of the branches of the Paris University, and a large number of housing projects. Fewer people are familiar with Créteil's old town, which has a lively pedestrian shopping street and the medieval St Christophe Church, near the rural and bucolic Ile Sainte Catherine island and its river banks. This little known haven of peace and greenery is perfect for boating in the shade on hot summer days and offers a stark contrast with the concrete and glass jungle in the rest of the suburb. Créteil is also home to numerous prominent sports clubs and athletes; the twice Tour de France winner Laurent Fignon was a member of the Créteil cycling club. 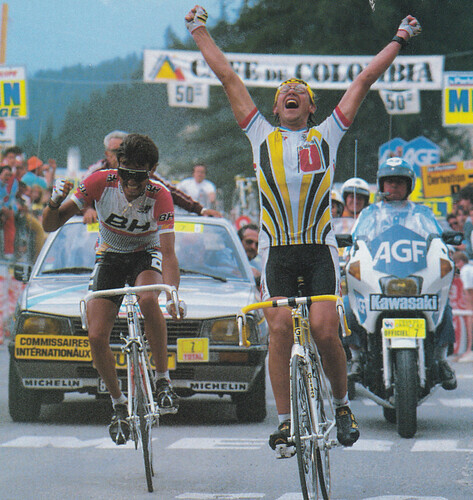 The 2011 Tour paid homage to Fignon, who died in 2010 just one month after covering that year's Tour de France for French TV. His admirers can pay their respects to him at the famous Père Lachaise cemetery in eastern Paris, where numerous other famous personalities are buried, including Oscar Wilde, Jim Morrison and Chopin. 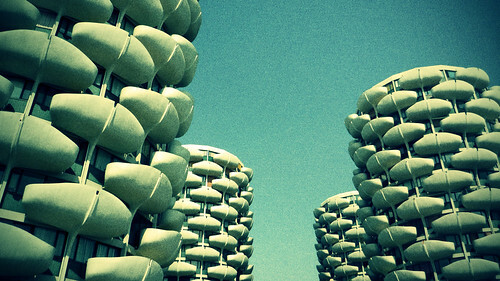 After Créteil, the ride loops west through the towns of Vitry-sur-Seine, Ivry-sur-Seine and Alfortville, all industrial towns along the Seine, before heading back east towards Saint-Maur-des-Fossés, a posh town neighbouring Créteil. In Saint-Maur, it passes the imposing Art Déco building of the renowned Lycée Marcellin Berthelot (Senegalese poet and future President Léopold Sedar Senghor taught French literature there in the late 1930s) before heading north across the bridge to Champigny. The Saint-Maur route marks the eastern edge of the oldest part of the town, Le Vieux Saint-Maur. It has a lovely park with the ruins of an abbey founded in 639 by the queen Nanthilde, making it one of the oldest abbeys in France. The abbey was sacked and rebuilt several times before it was completely demolished sometime shortly after 1750. My favourite feature in the abbey grounds has no sign pointing to its location and nothing to even hint at its existence, but in the far rear right corner and high up on the hill sits a piece of pre-historic history in the form of a menhir (an ancient standing stone from the Neolithic period (roughly 4,500BC to 1,500BC). The menhir, despite having been moved from its original position due to vandalism, has survived as a pagan monument in the midst of the most Christian of places. Just a few metres from the abbey is the square of Le Vieux Saint-Maur. You'll notice the St Nicolas medieval church, dated to the 13th century but likely originally built prior to the 10th or 11th century, and is a hodge podge of Romanesque, early gothic and modern renovation. In the back right corner of the church is a wooden sculpture of the Virgin Mary in polychrome paint. There are signs in the church and in the abbey grounds that give conflicting versions of how this statue came to be but I'll give you the short version where both stories intersect. The statue was carved in 1069AD by a sculptor who was working on the statue when he was called outside by his master. Upon his return, the statue was miraculously completed. Thus the church became widely known and visited by the faithful and was an important stopover on the pilgrimage trail to Santiago de Compostela. Adjacent to the church is a prominent brick building that was featured in the 1958 Oscar-winning film Mon Oncle by Jacques Tati, however, the facade was redecorated in the film so you wouldn't notice it if you were watching the film. The film is commemorated by a small statue in the park opposite the church. Leaving Saint-Maur, the ride continues into the riverside towns known for their guinguettes, Joinville and Champigny. The guinguettes were riverside drinking/dance halls that started at the end of the 19th century. Many of them were immortalised by Impressionist era painters such as Renoir and Sisley. They were located on both sides of the Marne, with ferries shuttling people back and forth across the river. They started to decline after 1950 when accordion music fell out of fashion, although there has been a recent revival of sorts with many guinguettes operating on weekends from late spring to early autumn. Chez Gégène is the most emblematic of the guinguettes. We then go east to Bry-sur-Marne, which has a lovely old centre. Follow the riverbank bike lane and you'll see a metal footbridge, the Passerelle de Bry, which was built in 1894 and designed by Gustave Eiffel (yes, *that* Eiffel). From Bry-sur-Marne, it's upwards through Le Perreux (which also borders the river Marne) before heading back west in the direction of Paris through Fontenay-sous-Bois and Vincennes. Both cities border one of Paris's two large forested public parks: the Bois de Vincennes. In Vincennes, the Tour passes the Château de Vincennes and its wooded park. A former royal town, Vincennes still boasts its medieval castle and keep, one of the most imposing in Europe. At first a hunting lodge (the surrounding wood provided game), it became a royal manor then a royal castle until Louis XIV settled in Versailles. It later became a prison for well-born prisoners (Marquis de Sade was one of them); more recently, Mata Hari was executed here in 1917. The fortress is now open to visitors. In the 19th century, the wood was a military training camp before Napoleon III converted it into a leisure park for the working classes of eastern Paris, and as a symetrical pendant for the Bois de Boulogne, built on the other side of the city for the pleasure of the ruling class. Nowadays, the wood is great for relaxing bike rides. The Bois de Vincennes is also home to the Parc Floral, which exhibits flowers and plants, and hosts temporary exhibitions. There's also the famous Vincennes horse races, held at the Hippodrome in the southern part of the wood. On the right of the route, downtown Vincennes feels very much like an arrondissement of Paris with its vibrant and busy shopping streets and Haussmanian style architecture, just as does its smaller and even posher neighbour Saint-Mandé that the tour will then go through before riding across the western part of the wood. As they exit the Bois de Vincennes, the cyclists will ride through Charenton, another rich suburb bordering Paris, and the wood before crossing the Périphérique ring road circling Paris and finally entering Paris proper and on to the Champs-Elysées further west. Bruce McAleer is a Paris-based American cyclist. With his French wife Véronique, he runs French Mystique Tours, a small tour company offering trips to various regions in France, but specialising in day-long trips into the countryside near Paris. Click the 'Bike Tour' tab on his website for detailed trip reports and photos for rides within easy reach of Paris. See our bike rental listings for bike hire in Paris. See this day ride from Fontainebleau to Milly, day rides in Paris, and this blog about how Paris became bike-friendly. We also have an article on the London-Paris Avenue Verte. Check here for links to accommodation in France, or browse the map below. See our guide to watching the Tour de France, plus the Tour de France in Numbers and A Beginner's Guide to the Tour de France.